Recently, these bottlings came across my desk, courtesy Infinium Spirits and Republic National’s Cumberland Division. I sat, pondering what to do with the tequilas held inside these two, beautiful vessels. Then, a thought occurred to me: why not a side-by-side? Not wanting to leave well enough alone, I decided upon a special tasting with two friends- Gayle DeMerssmen, a cocktail enthusiast and Elyse Glickman, Editor-and-Chief of the recently launched Liquid Living Magazine. The primary aspect separating these two tequilas, I found, was their involvement with wood. The Corralejo kissed the wood at 4 months in a combination of French, American and White Oak. The Casa Noble embraced the wood for the maximum 364 days (to be called ‘reposado’) in new French oak. The differences couldn’t have been more drastic. In color, the Corralejo was just off-white; the Casa Noble, a light tawny. Both noses had a restrained agave expression. The former possessed a certain crispness, the latter a buttery roundness. On the palate the Corralejo had a citric backnote that also hinted of sea-air, while the Casa Noble expressed butterscotch and vanilla. Tequilas tend to taste predominately like agave- like tequila. You simply can’t get past the fact that they are distillates of a cactus, which is a good thing. This technique involves tricking the palate into thinking it is tasting something in the actual drink or food by turning on taste receptors prior to the actual enjoyment of the cocktail/dish. Simply put, one enjoys a raw, singular product before then turning attention to the main attraction. On this occasion, I played to the marriage of citrus and tequilas. Like the tradition of biting the lime before the shot, just enhanced. We ate ‘Extreme Sour Apple Pop Rocks,’ available cheaply online. These not only have the CO2-influenced tactile effect of waking the taste buds up, they also have the mouth-puckering effect of citric acid. The Corralejo loved the effect, with it’s just-above blanco expression. The Casa Noble didn’t- the vanilla and butterscotch not only were overpowered, they fought it out on one’s tongue. At the end of the day, the three of us found this experiment not only entertaining, but enlightening. As is often the case- when questions find answers, these solutions produce a whole new set of queries. Such is the beauty of the culinary journey. Article written by BourbonBlog.com‘s Beverage Consultant Chef/Mixologist Stephen Dennison. Interesting but I have a question. I understand why you compared them but a triple distilled Casa Noble Reposado should be compared to the Triple Distilled version of Corralejo which is the flat round shaped bottle. A huge difference since I think it may be rested for longer than 4 months so maybe a better one to compare to Casa Noble. I have the Casa Noble and Corralejo Reposados which are triple distilled and my wife wanted to get the bottle because it was a nice cobalt blue flat and round bottle… And I was just curious so we bought it. I agree with all the observations and opinions about the Casa Noble Reposado however the Triple Distilled Corralejo is quite different from the bottle you have. The nose is somewhat harsh but agave is still a welcome and familiar smell. The tequila is good but it has a alcohol burn and smell once swallowed. It says TEQUILA and goes well with fresh lime juice and agave nectar for my version of a Margarita on the rocks. Casa Noble Reposado will remain my favorite Reposado to sip at room temperature! It will never be mixed with anything in my house. 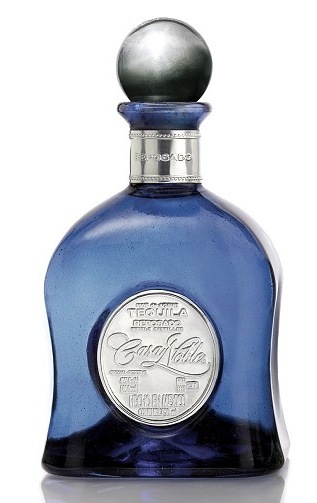 I have found nothing that compares to Casa Noble Reposado when enjoyed straight. Now I have a 5 year Casa Noble Ultra Anejo with the earliest style of 18k gold hand painting (The most hand painted gold on any of their Ultra Anejo bottles) on it’s way to me and the friend who is sending it USED to drink only Ultra Rare Porfidio Triple Distilled Anejo until he tried this Casa Noble. Now he trades rare bottles of his Porfidio to get the Casa Noble Ultra Anejo I will be enjoying in the next couple of days. Umm…agave is not a cactus, it is actually part of the lily family. never had Corralejo, so i cant comment at all on it. all i can tell u is i bought case nobile about 4 years ago, when it was not as known to the public. and while it is interesting and very distinctive, it also is harsh and not great at all! to appreciate the layers of tastes that do exsists with them. feel the Parton regardless of its mainstream popularity is the best Tequila. paton tequila silver tastes so pure & true and is almost perfectly smooth, respondo is very decent and anejo is a GRAND tequilla!! they also have one hell of a bordos patron if u can afford it! tastings & money from a unknown to most small batch brand. But Patron is just THAT GOOD! lightness of texture, purity of taste with zero negitive after tastes, no WAY over pepper tastes like Casa Nobile and in general is the best tequillia there is. we all want to find that rare elusive brand, that is best but sometimes it is right in front of you and just happens to be sadly very popular. !